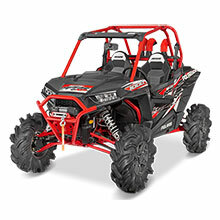 When the RZR was introduced, it opened a new world of automotive excellence in the Polaris brand. With a more compact body than previous UTVs from the manufacturer, it offered all the fun and function without as much bulk. When looking to outfit your favorite little powerhouse with all the latest extras and essentials, we have you covered with our selection of Polaris RZR accessories. We offer one of the largest selections of Polaris RZR accessories to ensure you get exactly what you need for your favorite vehicle. Since this is a vehicle used for work and play, you will find a wide range of products to cover both needs. From door graphics and coolers to storage bags and exhaust filters, we have it all in one convenient place with our inventory of high-quality Polaris RZR accessories. With a range of years covered, finding the right solution for your individual model is easier than ever. Best of all, we offer only high-quality solutions, so you can buy with confidence knowing the items you add to your vehicle will offer durable longevity and reliable performance. Whether looking for a way to protect your vehicle with the right sized covers, in need of all-weather floor mats to safeguard the interior against damages or looking to add a flag for added style and appeal, we have something sure to fit your needs with these Polaris RZR accessories. We are focused on only supplying you with the very best in terms of performance and quality with every product we feature so you can always buy with confidence. Add something extra to your vehicle today with these great options! We are committed to being your source for the needs of your vehicle whether for fun or function. With a high premium placed on customer interactions, we are always happy to assist our customers in any way while looking for the right part or accessory. If you have any questions, please contact us today for assistance.